The F-5100 Series, manufactured by Air Logic, is a subminiature pressure switch interface from pressure to electrical control circuits. It is suitable for high-pressure and low differential applications.The switches have three electrical terminals: Normally Open, Normally Closed and Common. 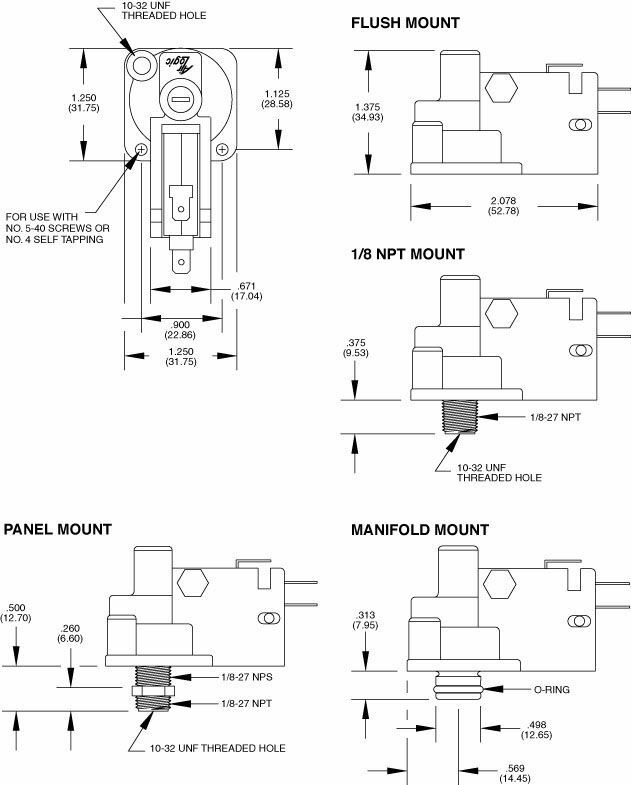 Four mounting styles are available: Flush Mount, Manifold Mount, Panel Mount, and Pipe Thread Mount. The switches are provided with a B80 Barb, 10-32 UNF Barbed Fitting, for 1/16" I.D. tubing unless otherwise requested. It has a single pole or double throw switch action and an electrical rating of 15 AMP as a standard. No selection number is required. 0.1 to 25 AMP switches are also available. Furthermore, it has an operating speed of 25 milliseconds, a maximum signal pressure of 100 PSI and an adjustment range of 0.5 to 100 PSI, +/- 0.5 tolerance on the initial starting pressure.